Not to be repetitive, but in my last post I lamented about my dismay with some of the new styles coming down the pipeline at J. Crew. Scanning through the latest crop of new arrivals for May definitely confirmed my thoughts about this. I saw one thing that I wanted, and it happened to be from the "collection", which is the pricier tier of clothing from the brand. Long gone are the days of lusting after piece after piece. 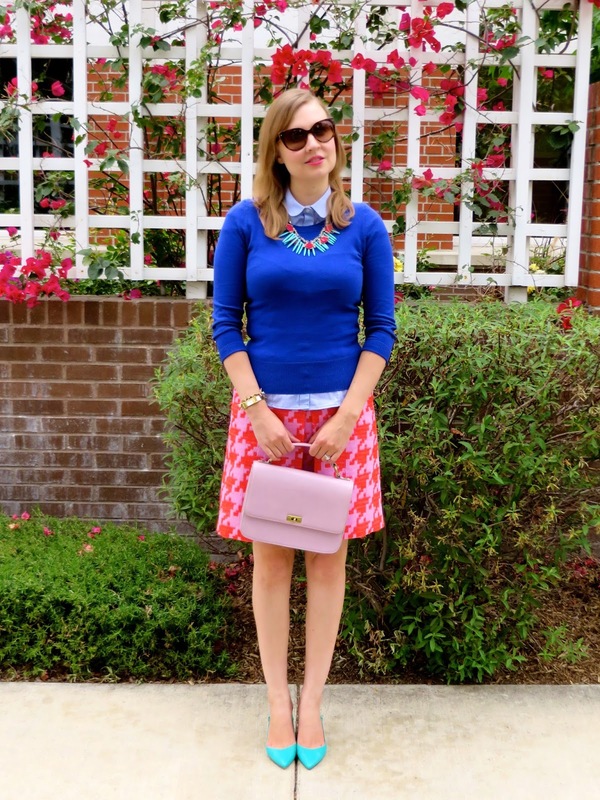 For example, when this "Pixelated" houndstooth skirt came out two years ago I was completely sold on it. In fact, I was so enthusiastic, I think I bought it at almost full price with just a mere extra 30% off new arrivals discount. However, I am a sucker for anything with a houndstooth print. Maybe it's the fact that the word "hound" is in the name? Or maybe it's that the print some how manages to be simultaneously classic and modern at the same time? Or maybe I still have aspirations to be like Gwen Stefani circa the "Rock Steady" years when she did an entire video clad in houndstooth? Whatever it is, I can't get enough. Do you have a particular print that you love more than anything? Below is a close up of my new necklace from LOFT. I thought the pictures above didn't do it justice, so I added this one for a closer look. It has almost a South West vibe with the faux turquoise. Also, it's now on super sale at an extra 60% off sale at LOFT! Necklace: LOFT here and on sale! 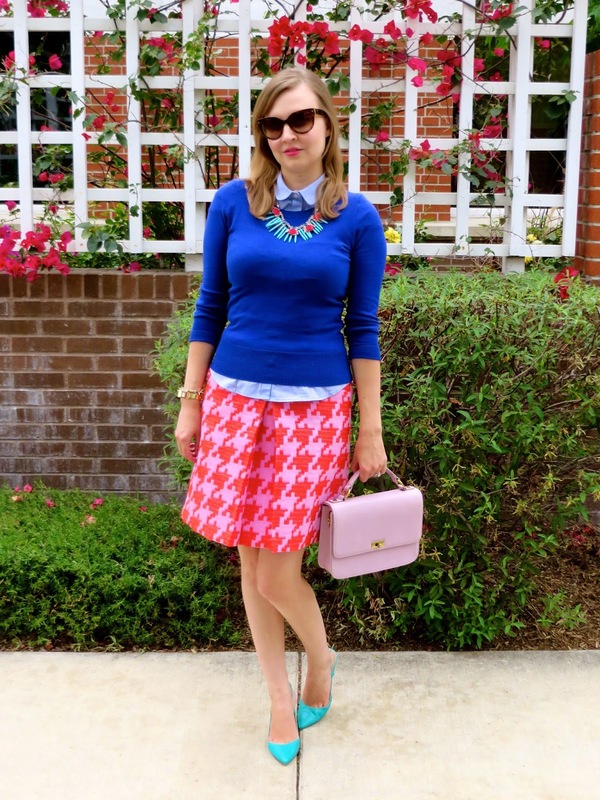 I am in love with the pink houndstooth skirt, necklace and pumps. Turquoise, royal blue, pink and red pair so well together! Yes, I love all of these colors together too! Have a great weekend! I'm quite in love with your entire ensemble, so classy and lady-like. That little pink bag just added the perfect final touch. Thank you! I thought the bag helped to add just a little retro feel to the look. Thanks for stopping by! I can't believe how well you pulled off this outfit! There is so much going on, but it all looks amazing together. 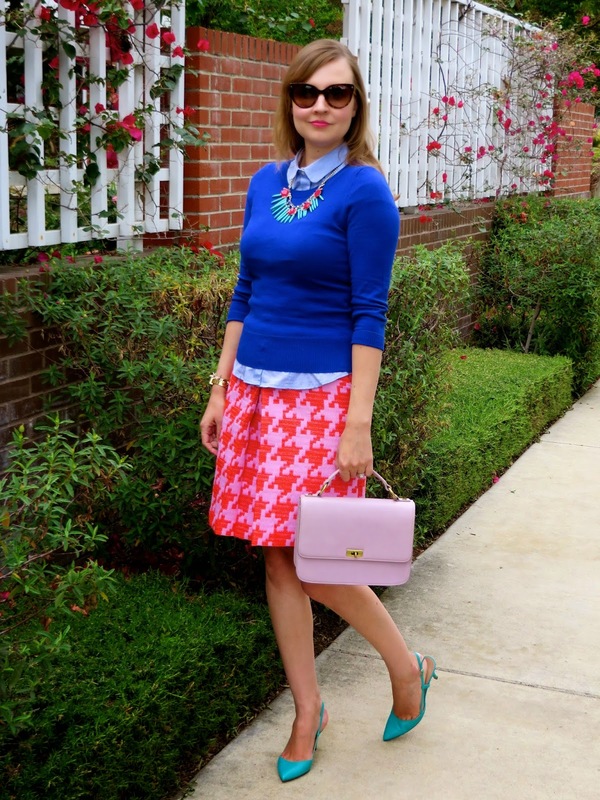 I love the bright blue with the pink houndstooth skirt, and that necklace IS a beauty! Thanks! I have worn this skirt so many times before with other things, I thought it was time to mix it up with something a little different. I think I'll also get a lot of use out of this new necklace. Wow, purse twins! I actually have this purse in cobalt "Casablanca" blue too. The red was also a gorgeous color. I wish J. Crew would bring the Edie bag back! I love houndstooth too and recently bought a black and white houndstooth scarf! Love this adorable look and that skirt is way too cute on you! Thanks for sharing with FFF! 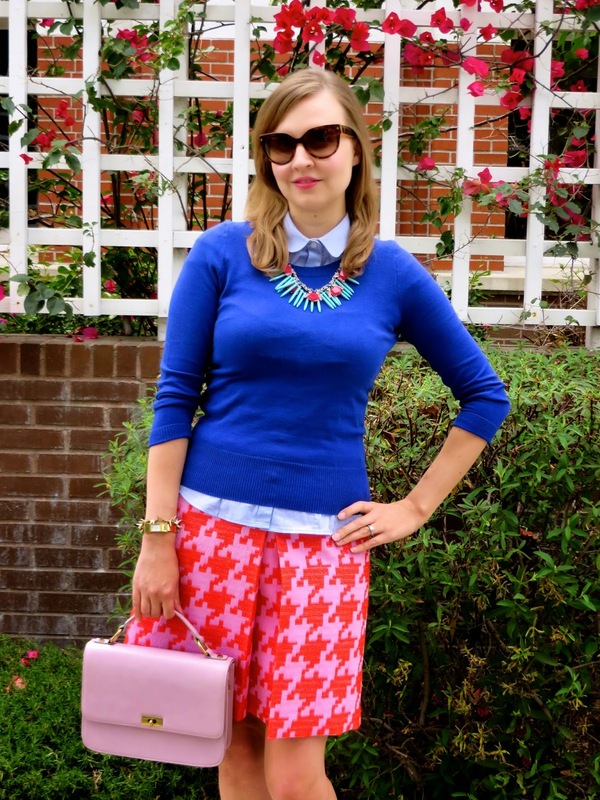 Houndstooth is such a wonderful print! I bet your scarf is gorgeous! Thanks for hosting the link up! 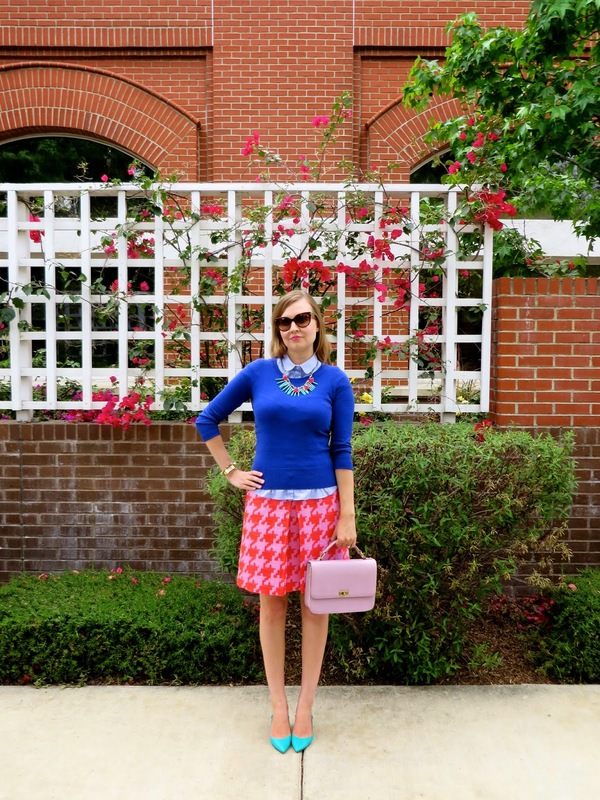 I am a sucker for houndstooth, too and that pixelated pattern and bright color is def. worth paying full price! I really love how colorful this outfit is, so fun! Yes, I thought so too. Usually we are so used to see the traditional black and white houndstooth (which is amazing) but this version was definitely something different. Thanks for stopping by Carrie! Oh my gosh this look is DARLING!! it screams Mad Men to me! Thank you Lindsay! Yes, I can definitely see some of the vintage/retro 60s elements in the look now that you mention it! Thanks for stopping by! Love your look! Great color blocking! 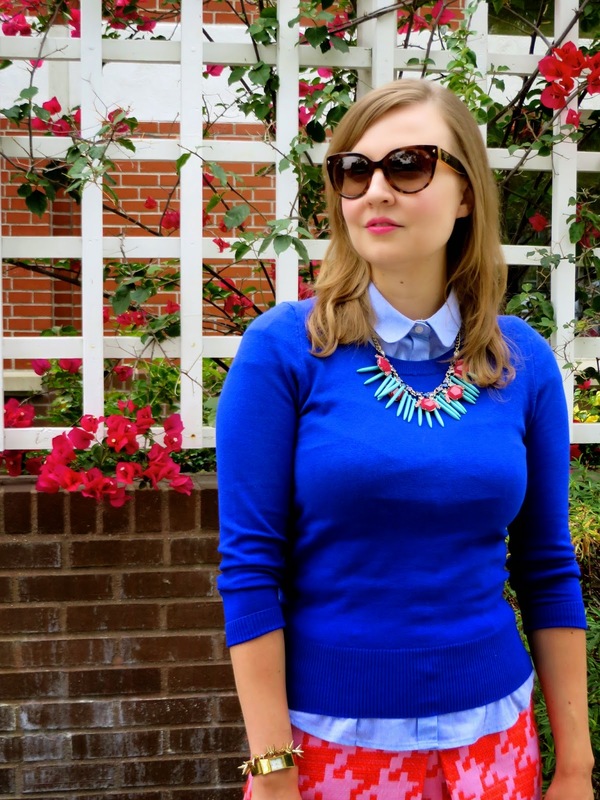 This color combo is lovely on you! The colors of this outfit...so vibrant! I am so bummed I missed out on this skirt, I remember seeing it and it sold out so quickly. Thank you for joining TBT Fashion link up and hope to see you next week. Have a great weekend!